The Pacific War Online Encyclopedia: Stevens, Jack E.
Table of Contents Next: Stilwell, Joseph W.
Jack Stevens was born to a working class family in Victoria and went to work in a cigar factory at age 12. In 1915 he joined the post office as a clerk in the electrical engineer's branch. He served a year in the militia before enlisting in the Australian Imperial Force on 2 July 1915, was trained in signals, and quickly rose through the ranks. He fought with distinction at Pozières and at the Ypres salient, Belgium, and received a battlefield commission on 17 January 1917. He remained in the militia following the First World War, and was selected in April 1940 to activate 21 Brigade, being promoted directly to temporary brigadier. He commanded the brigade in Syria, winning distinction by personally leading the difficult assault across the Litani River in spite of being wounded. 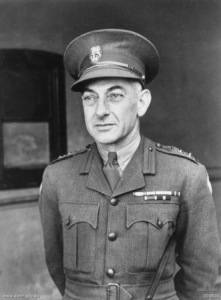 Stevens returned with his brigade to Australia in March 1942 and was promoted to command of 4 Division. Over the next few months he was given additional responsibility for militia and service forces in northern Australia, culminating with command of the newly raised 12 Division. In April 1943 he took command of 6 Division at Aitape. Early in 1945 he controversially ordered the division to aggressively probe eastwards toward Wewak, where the Japanese at Wewak were isolated and struggling simply to feed themselves. Stevens was a short, slender man, but "waspishly aggressive and persistent". Following his retirement, he was active in the development of atomic energy in Australia.